In the first flash of Lenovo K3 note, 47,440 units sold via Flipkart todat at 3PM. 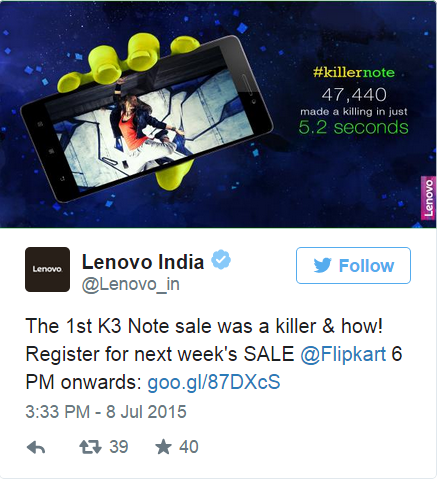 Lenovo sold a total of 47,440 units of K3 Note on Flipkart in 5.2 seconds. The company had yesterday revealed that over half a million users have shown interest in the Lenovo K3 Note by registering on Flipkart. The company has announced that registrations for the next week’s sale which will begin at 6PM today. The K3 Note joins Lenovo’s lineup of affordable 4G-capable smartphones in India that includes the likes of A6000 Plus, A7000, priced in the budget segment (Rs 10,000), and the S60 priced at Rs 12,999. 5.5-inch full HD display, the K3 Note is currently the most affordable smartphone in India with a 1080p display.